This is one of those sets you suspect will ooze quality even before putting the first disc into your player, and as far as I’m concerned these expectations are amply realised. This is the first time Isabelle Faust has joined forces with Il Giardino Armonica, but her understated virtuosity suits their relatively intimate and chamber-music scale of orchestral sound perfectly in these concertos. The booklet notes begin with an outline of Andreas Staier’s choices when it came to preparing the cadenzas for these concertos, no originals by Mozart having survived. He takes on some of the characteristics of those for some of the piano concertos, but in the end is more interested in enhancing these concertos’ affinity with Italian operatic style, imagining how the composer would have exploited “a violinist of the stature of Isabelle Faust, [for whom] he would also have drawn on his full range of resources.” These cadenzas can as a result be a little longer and more extravagant than one might expect, but once again they seem to fit the proportions of the whole with an ideal synergy that by no means disturbs the flow of the performances as a whole. With such popular works we get into comparisons pretty soon, so I dug out the two discs of Richard Tognetti with the Australian Chamber Orchestra on the BIS label (review of vol. 1). Tognetti’s orchestra has a similarly chamber-music feel but with a fatter, warmer sound, over which the violin is also more sweet-sounding than Faust. This is that compelling mix of amorous expressiveness and lightness of touch that I still greatly admire from Tognetti. Faust and Il Giardino Armonico are cooler in general, though by no means without expressive passion – and indeed, if it is that Italian operatic atmosphere you seek then these forces portray this image to perfection. The Harmonia Mundi recording is more part of that world of 18th century theatre rather than an idea of a grander, concert-hall projection. Another version I have is Mirijam Contzen and the Bayerische Kammerphilharmonie on the Oehms label (review). This goes for the authentic world of a lower tuning, but in its recorded balance sets the soloist more forward than the others, slightly undermining that chamber-music feel that is otherwise also well represented here. Tempi tend to be on the brisker side with this recording, which adds to the lively feel of the outer movements, giving the central movements less of the adagio or cantabile feel than either Tognetti or Faust, but also introducing a sense of operatic drama which has its own qualities. Couplings for the various sets vary of course, with Contzen sticking to the Violin Concerto in D major, K271A which Faust’s set dismisses as spurious. Isabelle Faust has decided to minimise vibrato in her playing of these concerti, using it as ornament rather than a quality of tone. I find this to have a rather magical quality, especially in slow movements such as the Adagio of K 219, which draws you in onto the edge of your seat and holds you in its spell, conjuring the spirit of J.S. Bach as well as inhabiting the fashionable galant sensibilities of the time. Tognetti colours his tone more, by no means vibrating excessively, but bringing the world of Haydn more to mind – looking forward somehow, rather than standing on the shoulders of ancestral giants. Faust and her players let the music breathe in the most natural way possible, delivering each dynamic accent but by no means over-egging Mozart’s already marvellously rich mixture of harmonic narrative and melodic commentary. I’m always at the risk of falling in love with each new recording of these works and recommending the latest as the best yet, but in this case your own tastes will have to dictate a preference. I’m still in awe of Tognetti’s abilities as a soloist and still hold his BIS set as one of my favourites. That said, Faust and her orchestra show an equally convincing and perhaps even more realistic way of presenting these masterpieces. If you love venerable but still highly respectable recordings by artists such as Arthur Grumiaux then Isabelle Faust will probably at first seem rather lightweight and underdone, but I would hope the transparency of these performances would soon convince. One of the things that stands out with Faust/Antonini is the integration of soloist and orchestra, creating a feel of closeness that is rare, to my ears at least. Tognetti as director/soloist comes very close indeed, but still sings above the orchestra in his own delightfully transcendent and slightly separate world. Other combinations such as Carmignola/Abbado or Fischer/ Kreizberg have fine qualities, but I’ve never found them transformative in quite the same way as Tognetti or Faust. 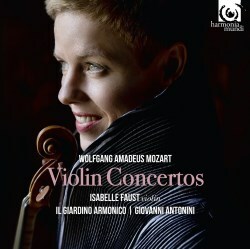 There are of course innumerable alternatives, but if you seek to discover or rediscover Mozart’s Violin Concertos then I doubt very much if you will be turning Isabelle Faust away if she happens to knock on your door.